Space per pupil: 144 sq.ft. 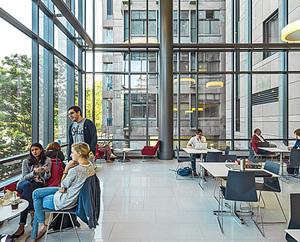 Located at the heart of an urban campus, the School of Law site overlooks the Charles River and occupies two buildings; the School of Law Tower, and the Pappas Law Library. Both buildings were designed by the Spanish modernist architect Josep Lluis Sert and were completed in the early 1960s. As is the case with many buildings of that era, the cast-in-place concrete had suffered significant deterioration and was in bad need of repair. 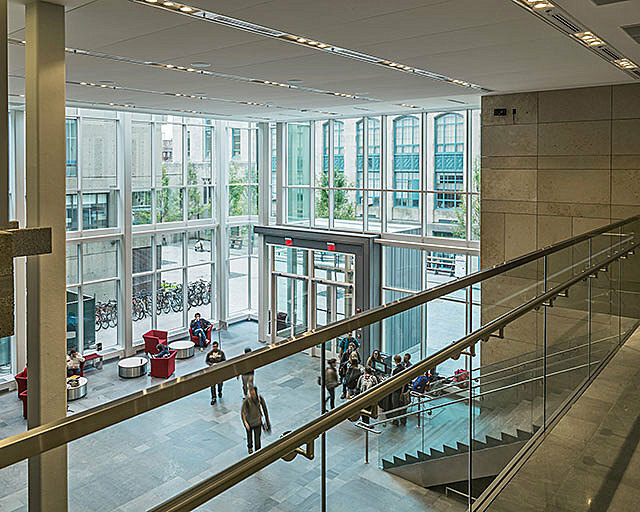 Addiitionally, the building’s original design and layout impeded the Law School’s intended use and growth. 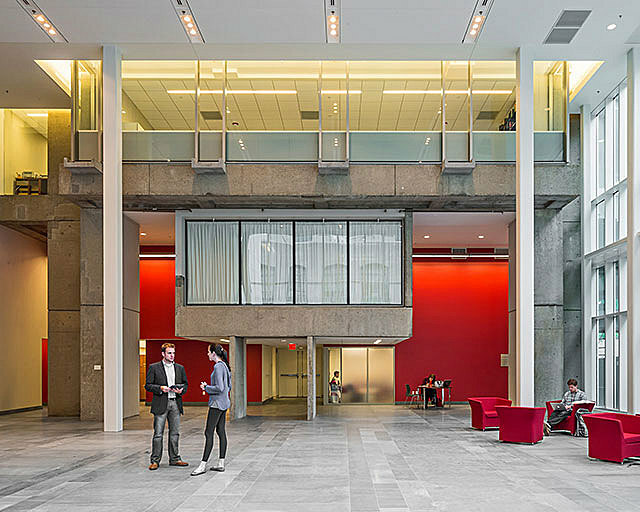 This comprehensive renovation and new building project was borne out of a Preservation and Development Master Plan that the submitting architect completed for this academic complex at the heart of the institution’s urban campus. 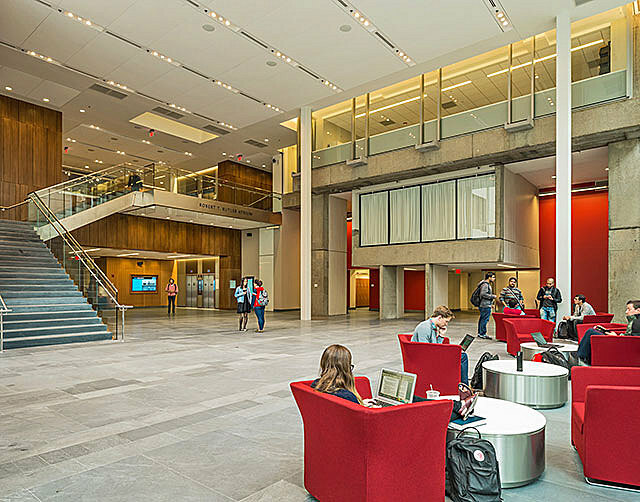 Phase I, submitted here, is a new five-story addition containing classrooms, study spaces, lounges and social gathering areas. 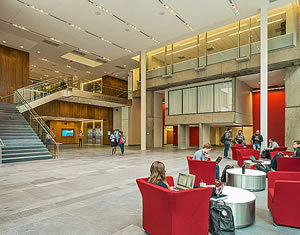 The addition was designed to relieve programming pressure from the tower by relocating the largest classrooms to the first two floors of the new building, thus eliminating the traffic congestion that had long plagued the tower. Phase II is the preservation and renovation of the existing 18-story tower, newly programmed to contain offices for the Law School faculty and administration. 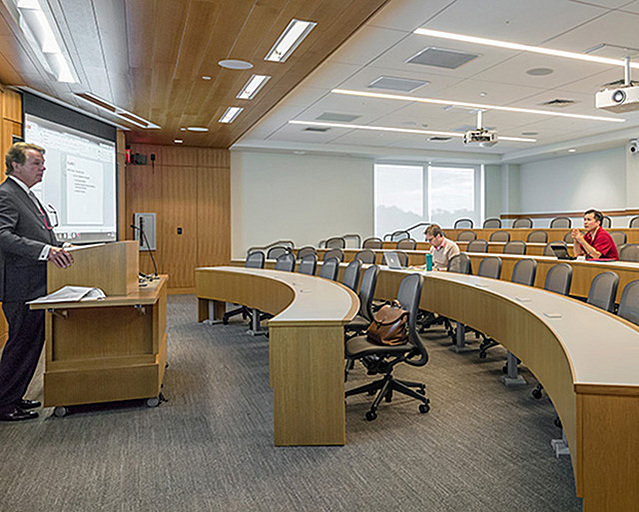 A few classrooms and the moot courtroom remain, which can also be accessed from the elevators in the new Redstone building. 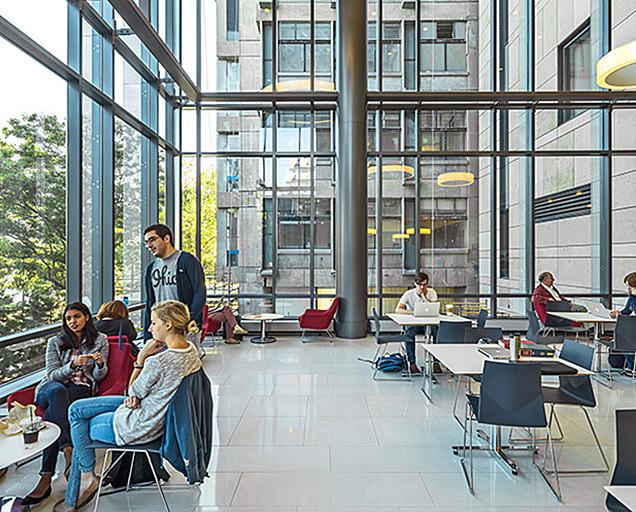 Interior Design goals: The institution and architect sought to create dignified environments reflecting purposeful design with shaped spaces that offer clarity of movement and circulation between primary spaces. There is a hierarchy of spaces and ceremony and sequence where appropriate. The design, detailing and material palette offer a richness of articulation; support formal, ceremonial, and informal spaces; and are timeless and appropriate to the rigors and rituals of the law and the study of the law. 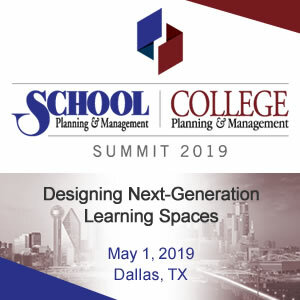 Unusual/innovative building components: Careful consideration was given to programming to emphasize connectivity, facilitate scholarship and build community. 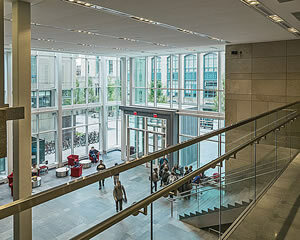 The large light-filled atrium epitomizes this, demonstrating the physical connection between the historic Sert structure and the new building, while creating a stronger campus presence and a visually distinctive entrance that welcomes visitors and students to the School of Law. 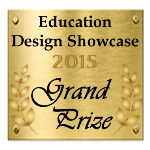 Sustainable design elements: The entire project – Phase I and II – is LEED Gold registered. Accessible/universal design elements: Relocated classrooms have redistributed building traffic and removed pressure from the elevators, ensuring easier access to resources for all students. 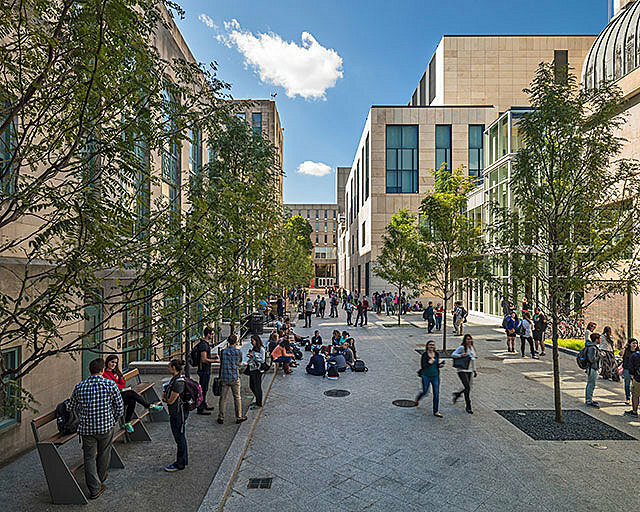 Urban context: Located at the heart of the Boston campus and on the banks of the Charles River, the Sumner M. Redstone Building is in close proximity to public transit via the Green Line and numerous bus lines, and is located along a lively pedestrian pathway. 21st century live / work environment: Smaller classrooms and dedicated special purpose instructional spaces for professional practice, clinical and transactional law, as well as a practice courtroom, are located on the upper floors of the new addition, establishing a “real-world” atmosphere for the study and practice of law. Others involved in the design process (users, artists, neighbors, etc. ): The program was developed in close collaboration with the Dean of the School of Law and her faculty. A faculty committee was convened and meetings were held on a regular basis throughout the design process. The campus facilities group oversaw construction.